Making the world a better place, one Evil Mad Scientist at a time. It was the 1960’s, and people were building some very interesting digital computers. One of them was the Digi-Comp II, which we have written about extensively: a binary mechanical computer based on rolling marbles and flip-flop gates. 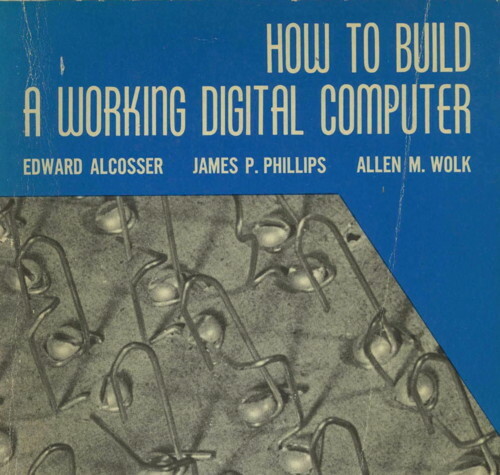 For an entirely different approach, look no further than How to Build a Working Digital Computer (1967) by Edward Alcosser, James P. Phillips, and Allen M. Wolk. You can download it as a free e-book (PDF, EPUB, Kindle) at Archive.org, thanks to the BitSavers PDF Document archive. How to Build a Working Digital Computer is both an introduction to the “new and exciting field of digital computers” and a set of plans to build one. 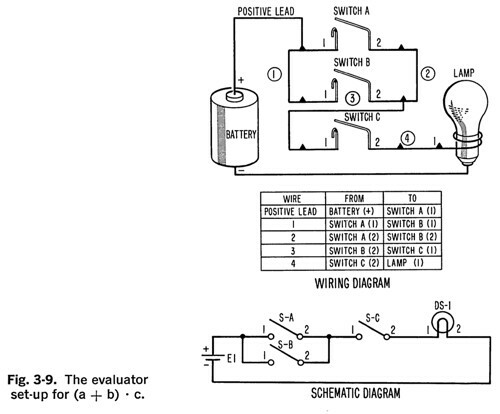 What’s especially interesting is that the plans don’t call for any specialized electronic components, but instead show how to build everything from parts that you might find at a hardware store: items like paper clips, little light bulbs, thread spools, wire, screws, and switches (that can optionally be made from paper clips). That’s not to say that such a computer is necessarily simplistic. Arrays of paperclip logic gates can get pretty big, pretty fast. 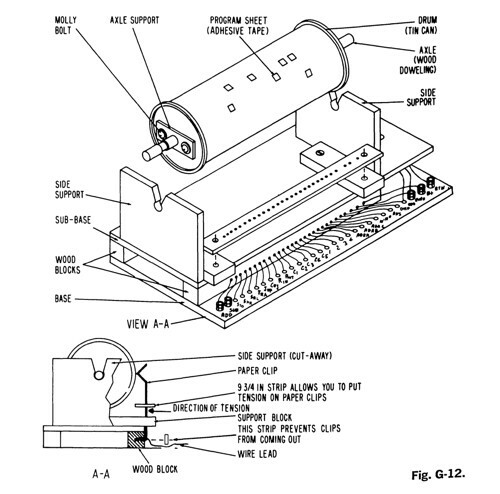 The instructions include a read-only drum memory for storing the computer program (much like a player piano roll), made from a juice can, with read heads made from bent paper clips. A separate manually-operated “core” memory (made of paper-clip switches) is used for storing data. So can this “paper clip” computer actually be built, and if so, would it work? Apparently yes, on both counts. Cleveland youngsters Mark Rosenstein and Kenny Antonelli built one named “Emmerack” in 1972 (albeit substituting Radio Shack slide switches for most of the paper clips), and another was built in 1975 by the Wickenburg High School Math Club in Arizona. And, at least one modern build has been completed, as you can see on YouTube. 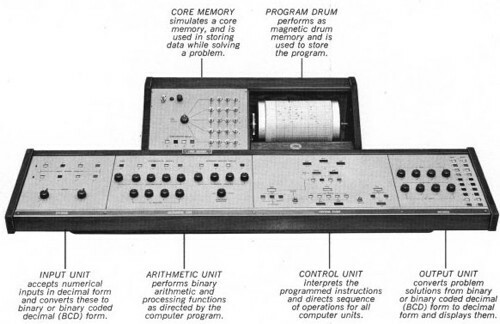 Perhaps more surprisingly, the “paper clip” computer was also the basis of the Arkay (later, Comspace) CT-650 computer trainer, a rare, early computer that seems to have been built directly from the plans in How to Build a Working Digital Computer. Photos of an original Comspace CT-650 posted recently at the Vintage Computer Forums show that this computer was a beautiful piece of work— no paper clips or tin cans in sight. This entry was posted in EMSL Projects, Engineering, Vintage Technology and tagged clippy, mechanical computer, paper clip, vintage computing. Bookmark the Permalink. IMHO, one of the most awesome, interesting aspects of these “primitive” computers is how little computing has really changed since that time. This book has a nice introduction discussing the underlying basics of computing, and it’s all still relevant. Clearly we’ve made advances. But all in an evolutionary way: computers are faster, with more varied and larger storage types, and of course we have many more ways to program them. 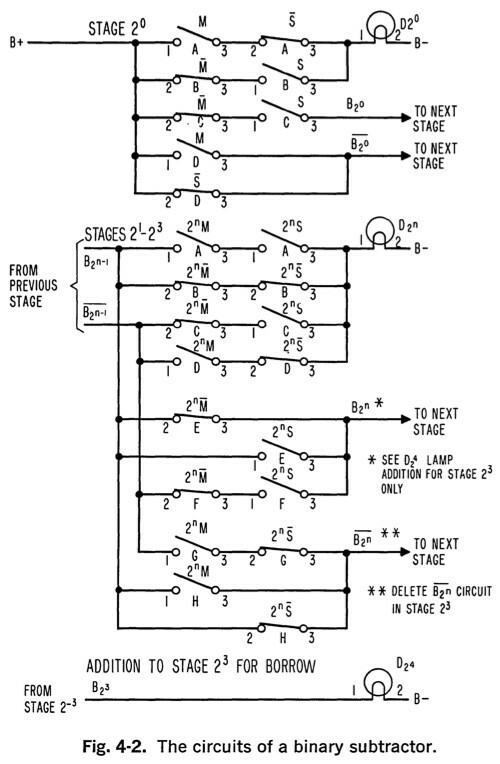 But computers still all pretty much operate in the same way: move from state to state, where the states are defined by switches that are combined to represent logical and arithmetic operations. It makes these types of projects, like Digi-Comp II (and variations thereof) and this paperclip-based technology, still just as relevant today as they were originally. I am the person who built this computer, and to the best of my knowledge it is the only one in existence at this time. The build was both fun and educational at the same time. The one shown at my channel on YouTube was built to scale from the book, with only two changes…..1 knife switches are still available but very dear in price, so I substituted slide switches…..2 the contacts for the program drum are ball point pen springs.I found that the paperclips ripped the paper program when the drum was rotated. The springs were flexible and did not tear the paper. Thanks for including me with a YouTube link in your wonderful article. Also, to those who keep asking for a demo of the computer, you will find a complete demo of a subtraction program on my channel gort59 on YouTube . When I was a boy, and only the rich people in the neighborhood had home computers (attached to their TVs) I read this book over and over again. It was because of this, and similar books, that I became a software engineer and have the lifestyle that I enjoy today. A couple of years ago I returned to the library in my old neighborhood to try and find the book, only to find there had been a booksale a few days before. I am so glad I found your site, and this post! My roommate in college (1979) built this on a piece of plywood he kept under his bed. He was and is an Electrical Engineer. What would be neat is to automate the functions so that instead of prompting the operator to flip switches, the computer flips them itself. The coolest parts of the original build are the handmade BCD switches. But can you play MAME on it? Copyright © 2006-2017 Evil Mad Scientist. Please visit our store!